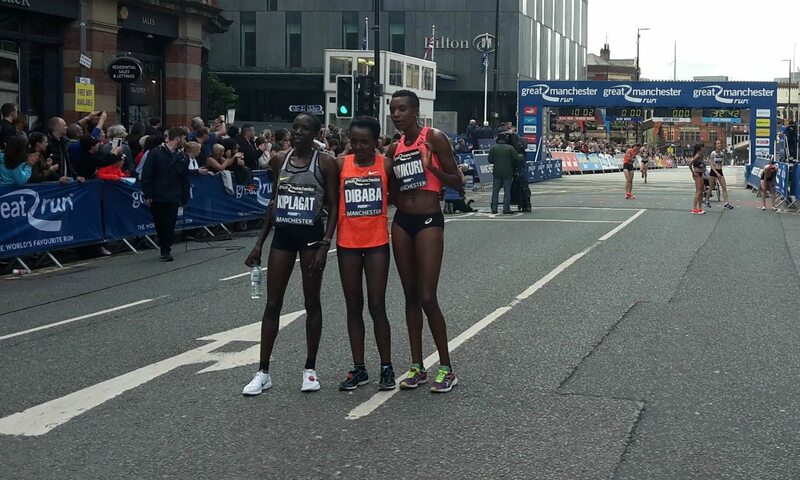 Tirunesh Dibaba set off on her road to Rio in winning style, while Kenenisa Bekele also returned to victorious ways to complete an Ethiopian double at the Great Manchester Run on Sunday (May 22). It was a repeat of the 2014 result, with the two distance running greats also having dominated down Deansgate two years ago, which was when Dibaba last raced before her break away from competitive action to have her first child, son Nathan Sileshi, who was born in March 2015. After Burundi’s Diane Nukuri took an early lead, Dibaba moved to the front and from there the three-time Olympic gold medallist always seemed in control. She stretched away from Edna Kiplagat in the final kilometre to cross the finishing line to big cheers and with 31:16 on the clock to complete a successful comeback. Two-time world marathon champion Kiplagat had edged ahead just after 8km, which was passed in 25:03, and looked like she was ready to make a move but she couldn’t shake off Dibaba. The Kenyan comfortably held on for the runner-up spot in 31:25 ahead of Burundi’s Nukuri, who clocked a 31:49 PB. “This was my first race. I was very nervous but I felt comfortable and good,” said 5000m world-record holder Dibaba, who hopes to make further history in her incredible career this summer by becoming the first athlete to win three Olympic gold medals over 10,000m, or indeed the first woman to win three successive Olympic titles in any individual event. She will now look to run a quick time on the track within the next month as she targets the Rio Olympics – a Games which the 30-year-old has said could be her last. Poland’s Dominika Napieraj was top European, clocking 32:22 in fourth ahead of Ireland’s Fionnuala McCormack and France’s Christelle Daunay. Britain’s 2014 European cross-country champion Gemma Steel, who is targeting the European Championships half-marathon in Amsterdam this summer, continued to work her way back after illness and injury struggles to clock 32:43 for eighth, behind Italy’s Veronica Inglese. Just four weeks after his third-place finish in the London Marathon behind Eliud Kipchoge and Stanley Biwott despite not being fully fit, Bekele enjoyed a bittersweet victory in Manchester. Having learned just a couple of days before that he had only been selected as a reserve for the Ethiopia men’s marathon team for the Rio Olympics, the three-time Olympic and five-time world gold medallist on the track made a statement by striding away from former marathon world record-holder Wilson Kipsang, who he had also beaten in London last month, with 800m to go and clocked 28:08 for victory ahead of Kipsang’s 28:15. Australia’s David McNeill completed the podium places, running 28:39 ahead of New Zealand’s Zane Robertson, who had hoped to offer Bekele and Kipsang more of a challenge. On failing to secure a spot on Ethiopia’s marathon team for Rio, he added: “I can’t give up. I’ve represented my country for a long time and flown the flag in track races. Germany’s Arne Gabius was top European, clocking 29:44 in fifth, while to big cheers, Shaftesbury Barnet Harrier Richard Goodman impressed as he also dipped under 30 minutes to finish sixth in 29:57 on his 10km road race debut. The 14th edition of the event, which was set to reach the 300,000th finisher milestone on Sunday, saw runners pass the home of Manchester United at Old Trafford before heading out towards Salford Quays and returning towards the city centre to the finish line on Deansgate, which is where Great CityGames street athletics action had taken place two days before. Simon Lawson improved on his runner-up spot from last year behind six-time Paralympic gold medallist David Weir to dominate the men’s elite wheelchair race, clocking 21:20 ahead of Brett Crossley with 24:15 and Matthew Clarke with 25:21. Shelly Woods successfully defended her elite women’s wheelchair race title after battling with Jade Jones, clocking 25:21 to Jones’ 25:35. Nikki Emerson was third in 28:27. Next year’s Great Manchester Run weekend will see the addition of a half-marathon event, for which further information can be found here.